Filipinos really are grateful and blessed that Pope Francis is here in the Philippines. A lot of people will do everything just to see a glimpse of the Pope. Others waited for hours just to hear and attend a holy mass by Pope Francis. Pope arrived at Philippines last Thursday to spread his message of mercy and compassion to all Filipinos. Pope’s trip to Leyte was quite short because of the tropical storm Amang. His plane landed at the Villamor Airbase past 2 pm. 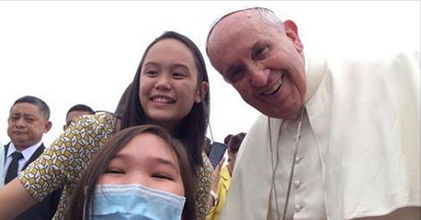 Villamor Airbase was already crowded but there’s one lucky devotee who got a chance to take a selfie with the Pope. 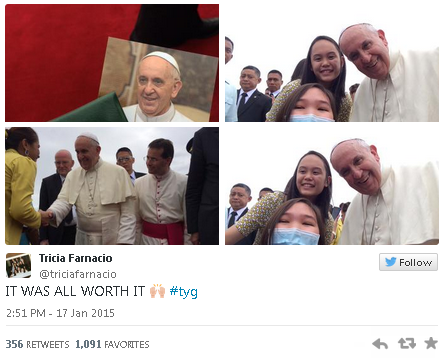 “It was all worth it” Tricia Farnacio said on her twitter account after she got to take a selfie with the Pope.